The inaugural meeting of the Early Modern Japanese Studies Workshop will bring together specialists from disciplines as diverse as literary studies, theater studies, history, and religious studies whose work deals with early modern Japan. This year’s theme is early modern cities. How were cities regulated and spatialized in the political imagination? How did literary works and theatrical productions or maps and gazetteers contribute to the formation of cities? How might early modern representations of cities—both what they include and what they pass over in silence—unsettle our present-day assumptions about the nature of urban space or the experience of urban life? How did goods and knowledge circulate through urban spaces? What new perspectives on urban areas do studies of social margins, gender, and liminal spaces open up? 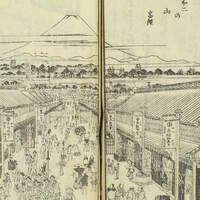 What categories and concepts are most useful for understanding the complex realities of the early modern Japanese city and its representation in diverse texts and documents? This two-day workshop, which will combine presentations, discussions, and readings of original archival materials, will deepen and expand our understanding of early modern Japanese cities in various literary representations, theatrical works, historical documents, and government regulations. At the same time, we hope to use this interdisciplinary forum to explore the state and future of early modern studies and elaborate on new methodologies.